Brenesia 16 (Supl. I): 39. 1979. TYPE: Costa Rica. Cartago: Tapanti Hydroelectric Reserve along Río Grande Orosi, 4.5 km beyond small bridge which crosses the river inside the preserve, along road to diversion dam, elev. 1,500-1,700 m, Croat 36079 (MO-2381175, holotype; CR, F, NY, US, isotypes; Live at MO). epiphytic or terrestrial; stems to 1 m long, 2-3 cm diam. ; internodes 1.5-2.5 cm long; roots 1 or 2 per node, ca. 5 mm thick, woolly-pubescent on drying; cataphylls moderately thick, 13-28 cm long, narrowly rounded at apex with a sub-apical apiculum, drying reddish-brown (B & K Yellow-red 4/10), subpcrsistcnt. 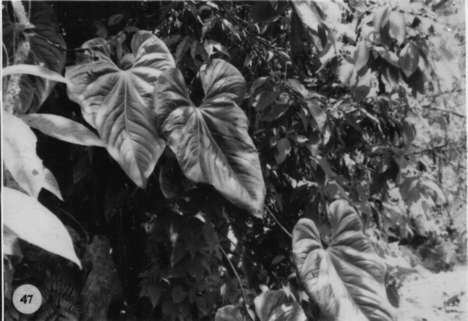 LEAVES erect-spreading; petioles 90-140 cm long, 1-1.5 cm diam., subterete, narrowly and obtusely sulcate; geniculum 3-3.5 cm long; blades ovate, moderately thick, short-acuminate at apex (the acumen minutely apiculate), deeply lobed at base, 35-70 cm long, 26-50 cm wide, broadest near point of petiole attachment; anterior lobe 25-48 cm long, the margins broadly convex; posterior lobes 12-22 cm long, directed downward; the sinus hippocrepiform, rounded to obtuse at apex; both surfaces semiglossy; midrib convexly raised above, diminished and sunken toward apex, acutely raised below; basal veins 5-7 pairs, up to 5 of them coalesced 2.5-6 cm, raised above and below, the posterior rib broadly curved, naked; primary lateral veins 4-7 per side, departing midrib at ca. 55° angle, then spreading at 35°-45° angle, loop-connected, sunken above, raised below; lesser veins less conspicuous; collective vein arising from uppermost basal vein, 5-15 mm from the margin. INFRUCTESCENCE to 10 cm long and 3.3 cm wide; berries not seen. Figs. 47 and 48. The species is known only from central Costa Rica on the Atlantic slope of the Cordillera de Talamanca in the region of the type locality. It inhabits lower montane rain forest from 1,300 to 1,800 m elevation. Anthurium clavatum belongs in section Calomystrium and is perhaps most closely related to A. fraternum Schott, A. hoffmannii, and A. nymphiifolium C. Koch & Bouche. which all share thick, persistent cataphylls. Anthurium clavatum differs from all of these by its clavate spadix. 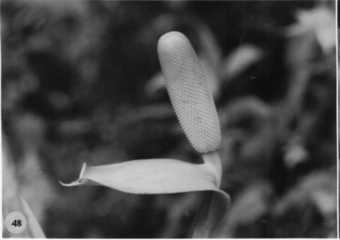 Another distinguishing feature is the broad spathe with a long cusp. Costa Rica Cartago: 1500-1700 m, 09.43N 83.47W, 12 July 1984, Michael H. Grayum & Pam Sleeper 3479 (MO). Costa Rica Cartago: 1500-1800 m, 9.43N 83.47W, 29 Sept. 1987, Thomas B. Croat & Michael H. Grayum 68252 (MO). Costa Rica Cartago:, , Utley & Utley 1624 (F). Costa Rica Cartago: Río Grande de Orosi,, , Cochrane et al. 6334 (F). Costa Rica Cartago: Río Grande de Orosi,, , Lent 940 (CR, F). Costa Rica Cartago: Río Grande de Orosi,, , Lent 998 (F). Costa Rica Cartago:, , Lellinger & White 1508 (CR, F, US). Costa Rica Cartago: Río Grande de Orosi,, , Utley & Utley 5616 (DUKE). Costa Rica Cartago: Tapantí Hydroelectric Reserve,, , Thomas B. Croat 36079 (CR, F, MO, NY, US). Costa Rica Cartago: Tapantí Hydroelectric Reserve,, , Thomas B. Croat 47050 (MO). Costa Rica Cartago:, , Luteyn 3259 (DUKE). Costa Rica Cartago: P.N. Tapantí; Valle del Reventazón, 1300 m, 09.45.20N 83.47.00W, 20 July 1994, Eduardo Lépiz 487 (CR, MO). Costa Rica Cartago: 1800 m,, 18 Dec. 1992, Herrera, G. 5771 (CR). Costa Rica Cartago: 1525-1595 m, 09.45S 83.47W, 7 September 1996, Thomas B. Croat 79067 (INB, MO, WU). Costa Rica Cartago: 1800 m, 09.45.55N 083.34.10W, 15 June 1995, Herrera, G. & I. Martínez 7907 (MO). Costa Rica Lim—n: 1800-2000 m, 9.23.03N 83.06.37W, 24 March 1992, Reinaldo Aguilar H. Schmidt 1152 (INB, MO).